In an abandoned building, a street-tough girl named Lucindra (her mother couldn’t decide between “Lucille” and “Sandra”) spars with Raphael, knocking him flat on his shell for the second time. She gently teases Raph while thinking about her own life; how she used to be a waitress in a bad neighborhood, but now she tends bar four nights a week and goes dancing the other three. While she originally found it hard to believe that the guy who called her for a sparring session turned out to be a ninja turtle, she isn’t too fazed. She’s fought ninja before and learned a thing or two from the encounters. Suddenly, Raph gets his second wind and pops Lucindra on the chin a couple of times. Lucindra retaliates quickly, nailing Raph right back in the jaw with a powerful kick. Lucindra remembers how Raph set up the sparring session because he said he was “rusty” at hand-to-hand. Although she got the better of him, she knows that Raph isn’t really rusty at all. Raph calls it quits and removes his sparring pads. Lucindra won two out of three falls, making her the victor of the session. She tells Raph that he’s “not bad for a turtle” and says that he can call her at 1-800-LET-SPAR for another session any time. Of course, since he lost the match, he now owes her a pizza. *Lucindra will appear next in TMNT (Vol. 1) #44. 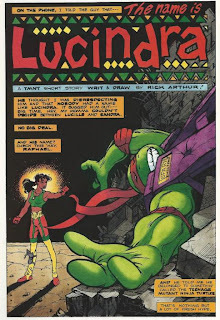 *The index for Turtle Soup #1 titles this story as just “Lucindra”, while the actual title on the first page reads “The Name is Lucindra” in large bold text. *Justin Hampton is not credited in the comic-itself. His credit can only be found in the index. One of the things the second volume of Turtle Soup was good for was setting up one-shot issues of the main TMNT (Vol. 1) series with these little prelude shorts. Of course, I didn’t know that at the time I was reading through TMNT (Vol. 1), so I found a few of those one-shot issues… confusing. I remember first reading “The Violent Underground” and wondering just who this Lucindra woman was and how she and Raph became such close friends. It was a pleasant discovery, when I finally got around to reading Turtle Soup, that my questions had concrete answers. I like Lucindra as a character in theory, if not so much in practice. The idea of Raph finding a human counterpart beyond Casey Jones interested me; even more so because Lucindra is a more skilled hand-to-hand combatant than Casey is and has a thing or two to teach Raph. Casey’s my favorite character, but more often than not, he was shown to be at a level beneath the Turtles when it came to fighting and I can imagine Raph getting “bored” sparring with Casey after a while. The problem with Lucindra is that she is a horribly dated artifact of her era. Every word out of her mouth (or her inner monologue) is just dripping with ridiculous early 90s street lingo and it’s a bit embarrassing to read. Now, the Turtles were never immune to shouting stupid slang like “cowabunga” and “radical”, but they were always just catchphrases and their normal speak was scarcely ever laden with the “hip” slang of the decade. Lucindra speaks almost entirely in early 90s-isms, often piled on so thick that Rick Arthur’s dialogue feels really stilted and insincere. Even in the early 90s, few people used THAT MUCH slang. Lucindra’s personal catchphrase is “Check it ‘kay” and she says it at least three times across 5 pages. She punctuates sentences with “‘kay” many more times and it can get more than a little irritating. And that’s before we get to phrases like “fresh”, “jammin’” and “buggin’ to the max”. Yeah. Still, “The Name is Lucindra” is a necessary introduction to the character and, beyond her obnoxious speech pattern, I do like the idea that the Turtles would actively seek other human allies instead of just stopping at April and Casey. Lucindra, though, does feel a bit “too perfect”. This is her first appearance and she spends it talking about how she doesn’t take crap from anybody and works at a bar and goes dancing, all while being a better fighter than Raphael and speaking in totally rad street slang and just being the most awesomely awesome new character EVER!!! I don’t like to throw “Mary Sue” around because that’s turned into such an overused buzz word as of late, but MAN. If there ever was a “Mary Sue”, Lucindra fits the bill. Rick Arthur’s art is stronger than his writing and while Lucindra’s inner monologue is certainly distracting (and bloated), if you take a second look at the story strictly to pour over the art, you’ll probably find it far more agreeable. There’s a lot of bone-crunching impacts in this story, as every blow landed between Raph and Lucindra strikes with real force. 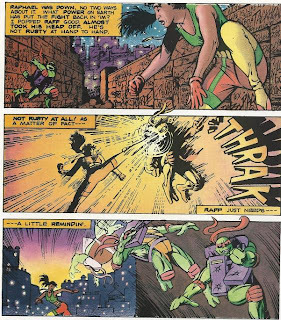 I love that panel on page 4 where Lucindra kicks Raph square in the jaw. It’s one of those images rendered so well it actually makes you wince and go, “ooph.” Justin Hampton’s colors bring a lot to the table and I dug how he rendered the lighting on the characters during the fight. Gotta love those glowing street lamps. “The Name is Lucindra” is not exactly the best-written story and Lucindra, despite serving an interesting purpose, can really grate on you during her introduction. But Arthur’s art makes this short pop and is certainly wonderful to look at.